Indie perfumer Dawn Spencer Hurwitz has launched the YSL Retrospective Collection, six new fragrances created in collaboration with the Denver Art Museum and inspired by their exhibit Yves Saint Laurent: The Retrospective. The fragrances are Ligne Trapéze, The Beat Look, Le Smoking, Euphorisme d'Opium, La Vie en Rose and Ma Plus Belle Histoire d'Amour. 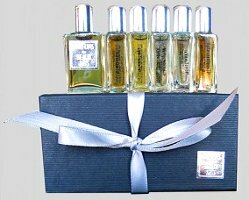 Dawn Spencer Hurwitz Ligne Trapéze, The Beat Look, Le Smoking, Euphorisme d'Opium, La Vie en Rose and Ma Plus Belle Histoire d'Amour are available in a boxed set (shown) of all six fragrances in 5 ml Eau de Parfum, $90. A sampler of all six in 1 ml is $45. The scents can also be purchased separately, 10 ml Eau de Parfum for $55 or 5 ml Parfum for $45. Update: see reviews of Ligne Trapéze & Le Smoking. Fragrance and Fashion ! I’m in heaven how interesting . I have only tried a few of DSH fragrances and only one of them really spoke to me, but I love the sound of Le Smoking and Ma Plus Belle Histoire d’Amour. Le Smoking; I can picture someone like Marlene Dietrich in a YSL tux holding a long elegant cig holder. Very Tamara de Lempicka and art deco – I know it’s not the 70s, but when the words women and tux are put together, I think of Marlene. Whether or not the scent is going to conjure up that image remains to be seen/smelt! I like quite a few, but it’s a huge line. These sound very interesting, and I would love to try them, but the pricing is all over the board. The 5 ml. set works out to be $3.00/ml. while the sample set is a whopping $7.50/ml.! The 5 ml is definitely more economical. Often that way though — larger sizes are less per ml. Brilliant marketing! I bet we see more of this. Fun, memorable, and in keeping with the theme. I think this is her 5th collaboration with the Denver Art Museum. I recently placed a fairly large order from DSH, and she threw in several extra samples, including Ma Plus Bell Histoire d’Amour and La Vie en Rose. MPBHdA is not really my style, but I really do like La Vie en Rose. Good thing too–I managed to spill most of the sample vial on myself while trying merely to sniff it, so I ended up wearing it all at once. I don’t find it to be too loud or aggressive, as many people find the original Paris to be. I think a small bottle is in order. And Robin–I too would love to see that exhibit. I only wish it could come to Houston. I loved the YSL documentary — now I can’t remember the name. Keep meaning to watch L’Amour Fou too. these all seem conceptually more interesting than what St Laurent’s own brand is putting out these days. Maybe they will look into that. How cool is this! I wish more companies did this kind of joint ventures with indie perfumers! i LOVE the idea of perfumes inspired by and based on perfumes! this is genius! i’ve just started to learn to make perfume and rather than being inspired by places or memories or visual art, i’m often inspired by the perfumes i already love. have often wondered when someone would do something like this! thanks for reporting on it.